Nicrome Stainless stocks a wide range of stainless steel systems and products from sink units to stainless steel cigarette bins. Solid and robust; our line of stainless steel products are cost-effective and provide fully functional solutions for your stainless steel requirements. Choose from a variety of superior quality stainless steel equipment and stainless metal products. The first choice for busy production areas. 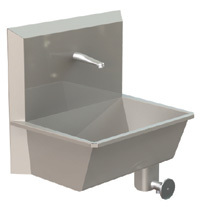 Designed for hygiene conscious environments, these sinks are manufactured using super brushed Stainless Steel. All sink units have been factory tested. Pedestal mounting units also available. 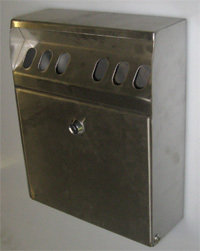 This wall mounted cigarette disposal bin is manufactured using stainless steel, providing maintenance free, easy to clean bin. The bin comes complete with lock, 2 keys, an stainless steel fixings. The large stubber plate and wide slot, collects the ash and cigarette ends and is not designed to accept rubbish.